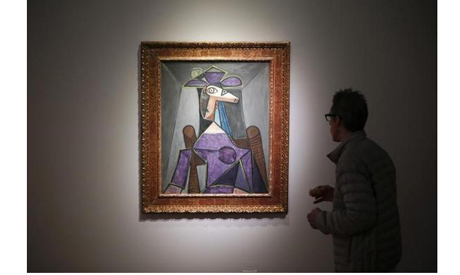 Trophy art sales including Monet's "Nympheas" and Picasso's "Portrait de femme (Dora Maar)" ensured bumper earnings for Sotheby's and Christie's in the first half, the auction houses said on Wednesday. The sale of Monet's "Nympheas" for 31.7 million pounds ($54 million) last month helped lift Sotheby's sales by 22 percent in the first half of this year to $3.12 billion. At rival Christie's, record-breaking sales of post-war and contemporary art helped push total sales in January to June up 12 percent from a year earlier to 2.69 billion pounds, including the Picasso and 51 other works fetching $10 million or more. Monet's "Nympheas", a painting of water lilies, recorded the highest price for any Impressionist work sold at auction this year, helping Sotheby's achieve its strongest ever sales in London of Impressionist and Modern Art, totalling 354.1 million pounds in the first half. "The record successes we have enjoyed in London this summer are the fruit of the combination of old rules and new players," Mark Cornell, Sotheby's Managing Director for Europe, said in a statement. "Old rules still apply: quality, rarity, provenance and correct estimates are key, and new players care just as much about those criteria as established collectors." Its sales to Asia jumped 47 percent on a year earlier to $490 million. Sotheby's, which earlier this week announced a partnership with online auction website eBay, said the market for online sales was growing exponentially, and that online bidders had competed for 17 percent of lots offered thus far in 2014. It said that 492 lots sold this year had reached prices exceeding $1 million. Christie's major sales in the first half were another Monet, "Nymphea", which sold in New York for $27 million in May, and at the same auction Picasso's "Portrait de femme (Dora Maar)", which went for $22.6 million, including commissions. In London, Francis Bacon's "Portrait of George Dyer Talking" sold for 42.2 million pounds in February, and an egg by U.S. artist Jeff Koons sold for 14.1 million pounds. Christie's said 24 percent of all buyers in the first half were new to the house. It also reported a 70 percent increase in online activity. "Digital engagement and new buyers coming to the market have continued to drive growth; new clients represented 24 percent of all buyers and 15 percent of the sales total in the first half of 2014," Christie's said. It said it would open a new Shanghai office in October and new galleries in New York City's Rockefeller Center in November to keep pace with growing demand. "Our strategy to engage this growing audience for art through auction, private sales and digitally has been validated and again welcomed many new buyers," Steven Murphy, its chief executive officer, said in the statement.